"Complex and haunting...vivid and unforgettable." "Ardent, ambitious....These glimpses of other lives are where the poetry of Palaia's writing is most striking....these 'unraveled souls' sting the hardest and linger the longest." 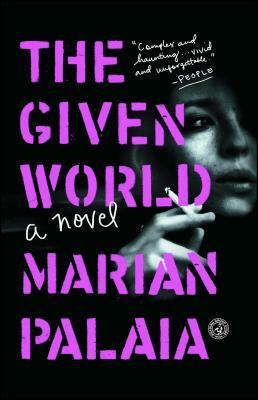 "In The Given World, Marian Palaia has assembled a collection of restive seekers and beautifully told their stories of love and lovelessness, home and homelessness, with an emphasis on both makeshift and enduring ideas of family. It has been a long time since a first book contained this much wisdom and knowledge of the world. She has a great ear for dialogue, a feel for dramatic confrontation, and a keen understanding of when background suddenly becomes foreground. She is a strong, soulful, and deeply gifted writer." "Not all the American casualties of Vietnam went to war. In stunning, gorgeous prose, in precise, prismatic detail, Palaia begins with that rupture and works her way deep into the aftermath -- its impact on one person, on one family, on one country. Riveting and revelatory." "Palaia is skilled at mixing bitter and sweet — an uplifting ending is loosely constructed and leaves a reader floating in a way that feels entirely grounded in how it captures life’s unpredictability." "Palaia demonstrates a magnificent command of craft for a first-time novelist, but it's her emotional honesty that makes this story so rich and affecting....An immensely rewarding and remarkable debut." "There is no denying Palaia's immense writing talent. She is able to convey three pieces of information in one elegant sentence, and she writes paragraphs that build meaning upon metaphorical meaning that leave your highlighter used up and dry--and you anticipating her next novel." "Palaia's prose is hypnotizing...fresh...not without a dark beauty." "What is likely to remain with reader is the haunting vividness Palaia brings to Riley’s isolated Hi-Line ranch, her down-if-not-quite-out San Francisco streets, and the decadent expat bars of postwar Ho Chi-Minh City." "Marian Palaia is a writer of remarkable talent. In Riley, she has captured Vietnam's long shadow with prose that cuts straight to the bone. Readers who enjoyed Jennifer Egan's The Invisible Circus will love The Given World." "Marian Palaia is a writer of startling grace and sensuous lyricism—reading her, you feel as if you've never heard language this beautiful and this true." "Some rare books give you the sense that a writer has been walking around with a story for years, storing it up, ruminating on it. This is one of those books. I'm grateful for the slow and patient emergence of these words on the page. No sentence is wasted. However long The Given World took, it was worth every minute." "From the moment I met Riley I was drawn into her world, which is really ours, America in the last century as it careened into this one. I found this novel as thrilling and surprising as a ride on a vintage motorcycle, along the winding, sometimes hair-raising but always arresting ride that is Riley’s life. It is a trip I will always remember." "Marian Palaia has imaginatively engaged the Vietnam War these many decades later and transformed it into a brilliant and complex narrative able to transcend that war, all wars, all politics, all eras and illuminate the great and eternally enduring human quest for self, for an identity, for a place in the universe. The Given World is a splendid first novel by an exciting new artist." "The Given World is astonishing in every regard: the voice, the range of characters, the charismatic, colloquial dialogue, the ability to summon, through telling detail, geographically diverse worlds that are far flung, but still cohere. Vietnam, counter-cultural San Francisco, the Vietnam War draft’s resonance on a Montana reservation, all give evocative shape and texture to an historical era. It’s edgy, often cutting, humorous, and impassioned."